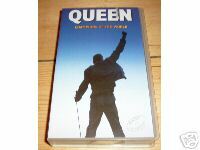 QUEEN CHAMPIONS OF THE WORLD VHS VIDEO. This is a brilliant and EXTREMELY rare Queen video. Running time 124 minutes. The video showcases the personal story behind Queen from the very beginning, featuring interviews, concert footage, video clips and a private look at the band's world. A must for any Queen fan! VHS PAL Video.